Plan to come early to the event – many of the local shops will have specials and discounts! The Wimberley Merchants downtown are planning a Sidewalk Sale starting on this Thursday and running through the weekend so it will be a great time to find some deals! Tickets may be available at the gate on a first come first serve basis starting at 4:30. All attendees will be required to purchase a ticket this year. COSTUMES: Encouraged but not required. There will be prizes! FOOTWEAR: Wimberley is charming and that means there are some uneven sidewalks and steps. Please wear shoes that allow you to enjoy this walking wine tour. WINE: Each winery will have samples to taste and also have bottles available for purchase. You will be limited to sampling each winery once so that you’ll have more time to try them all! Wineries will be selling your favorite bottles at their booths and you will find amazing food offerings for purchase. FOOD: Restaurants will be set up along the route with food to purchase. 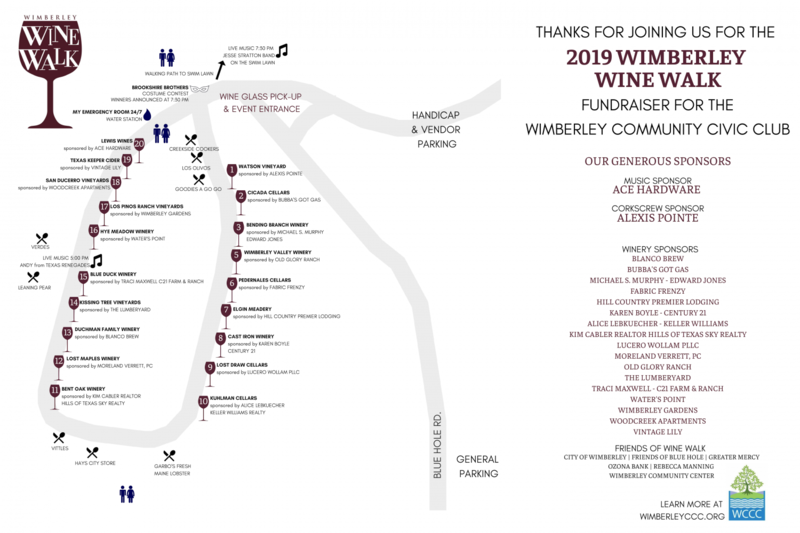 SHOPPING: Many of the shops in the downtown Wimberley area will be open prior to the event and have specials and discounts for participants. LIVE MUSIC: We will have live music both during the event and a concert beginning at 7:30 to wrap up the event! Join us on the swim lawn for live music from 7:30-9:00. RAIN: The event will go on rain or shine! Have fun, be safe and taste responsibly! Keep checking back for updates on your favorite wineries! Got questions? We’ve got answers! Fill out the form below and we’ll get back to you ASAP!